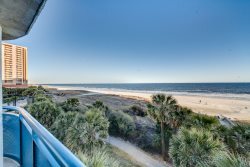 Situated along the northern east coast of South Carolina, Myrtle Beach is within a half day drive of much of the East Coast. Roadway expansion is ever evolving and the network of Highways and Byways to get to Myrtle Beach is making is easier and more convenient every year. The Myrtle Beach International Airport(MYR), will have completed a $118 million dollar expansion in early 2013, creating an even easier option for our guests. With direct flights to over 25 cities you can be on the ground in no time.